My plan for this morning's doodling included St Andrew's Cathedral, but there was no shade from the sun and there were far too many trees in the way - I'm bored with drawing trees. The impressive National Galley building on St Andrew's Rd was another possibility, but again there was little protection from the sun in the cloudless sky. There was a handy workers’ shelter opposite the Singapore Cricket Club, but somehow the building didn't appeal. 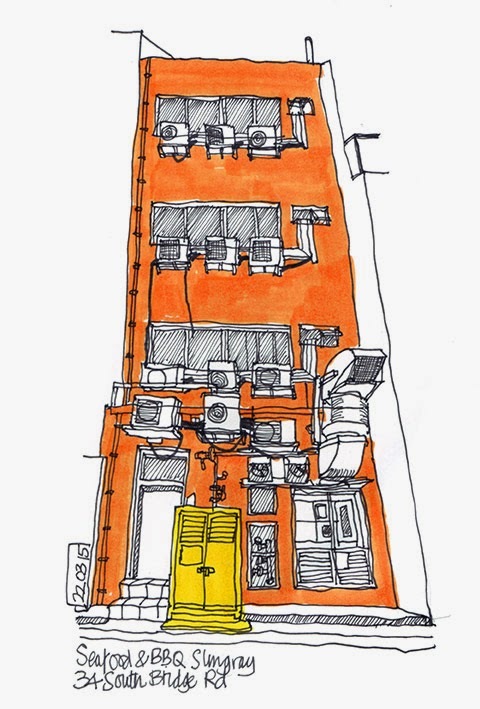 I wandered along the river to explore the area behind Boat Quay where I found a shady spot to doodle on a wall behind a seafood restaurant, accompanied by a team of ants busily investigating the source of the strong smell of dried fish. The sun managed to peek over the roof of the building forcing an early departure to an alley behind the restaurants which features hundreds of air conditioning units, exhaust ducts, pipework, old bikes, tatty sofas, stained plastic chairs, building material and a thick mist of burnt cooking fat. Ideal subject matter - I shall return. I managed to sketch the National Gallery perched on the root of an old tree inside St Andrews Cathedral. Well shaded too. Then I found a bus stop or shelter (almost completed construction) facing full view of the Gallery, and did that from 5-7 pm. Can't fight mosquitoes though - they always win.